The Car Care One card will get you back on the road when a big repair slows you down. Apply today and find out how the Car Care One card can change the way you approach getting your car serviced or repaired. 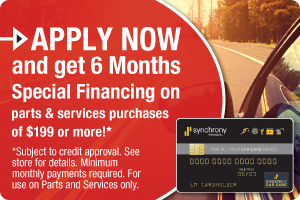 Low monthly payments, online account management from Synchrony Bank and just having a card designated for your car keeps you in the driver's seat even when your car is in the shop. Accepted at 16,000 locations nationwide.. ..Including all Exxon/ Mobil Gas Stations and all Lithia Stores and Dealerships. Next time your car needs and oil change, tire rotation, or brake inspection, bring it down to Acura of Honolulu. With our Up Front Pricing, Right Now Service and Fixed Right Guarantee you can be confident that your vehicle is in good hands at Acura of Honolulu. Apply for the CarCareONE Card Today and Keep Life Rolling.